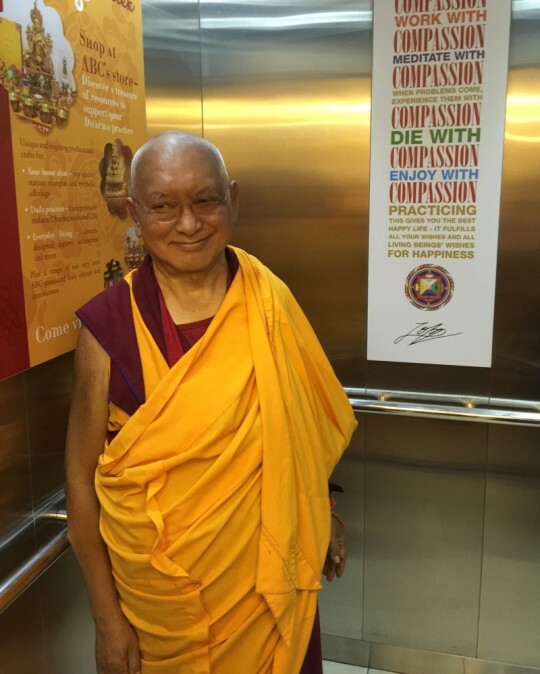 Lama Zopa Rinpoche at Amitabha Buddhist Centre, Singapore, March 2016. Photo by Ven. Roger Kunsang. A student wrote Lama Zopa Rinpoche because he was having a hard time after breaking up with his partner and was finding it hard to practice. Thank you very much your kind email some time ago. This time I want to share some quotations with you, so that you can understand more clearly now. Is like the water dew on the grass: it is in the nature of phenomena; it perishes momentarily. That which never changes is the sublime state of liberation. Seeking this is the bodhisattva’s practice. What this verse is saying is that in the desire realm, form realm and formless realm (i.e., “samsara”), the happiness there is temporary, not ultimate, not everlasting. Why temporary? Because it is in the nature of suffering: the suffering of pain, suffering of change and pervasive compounded suffering (the suffering of pain and change arise from pervasive compounded suffering). This happiness doesn’t last. The example here is “water dew on the grass.” It can drop down anytime. It can disappear at any moment. We have to realize that. Otherwise, if we don’t realize the nature of impermanence, then the concepts believing in true happiness and permanence then cheat us, cheat our life. That attachment to the wrong concept doesn’t allow us to achieve liberation from samsara: everlasting happiness. Instead, we’re always hallucinating and then always suffer in samsara. The end of living is death. This human body is extremely difficult to achieve. (Even more so,) it is so difficult to hear the holy Dharma (because it’s so difficult for Buddha to descend to the world). But it is definite one will be separated. But it is definite one will leave from here. But it is definite one will lose it. This is my advice for you to not forget in your daily life and normal-life mindfulness meditation. *The words in parentheses were added to the verses by Lama Zopa Rinpoche. Scribed by Ven. Holly Ansett, Aptos, California, United States, October 2015. Edited for inclusion on FPMT.org.